Tregs are potent suppressors of the immune system. There is a lack of unique surface markers to define them, hence, definitions of Tregs are primarily functional. Here we describe an optimized in vitro assay capable of identifying immune imbalance in subjects at risk to develop T1D. Waukau, J., Woodliff, J., Glisic, S. Human In Vitro Suppression as Screening Tool for the Recognition of an Early State of Immune Imbalance. J. Vis. Exp. (53), e3071, doi:10.3791/3071 (2011). Regulatory T cells (Tregs) are critical mediators of immune tolerance to self-antigens. In addition, they are crucial regulators of the immune response following an infection. Despite efforts to identify unique surface marker on Tregs, the only unique feature is their ability to suppress the proliferation and function of effector T cells. While it is clear that only in vitro assays can be used in assessing human Treg function, this becomes problematic when assessing the results from cross-sectional studies where healthy cells and cells isolated from subjects with autoimmune diseases (like Type 1 Diabetes-T1D) need to be compared. There is a great variability among laboratories in the number and type of responder T cells, nature and strength of stimulation, Treg:responder ratios and the number and type of antigen-presenting cells (APC) used in human in vitro suppression assays. This variability makes comparison between studies measuring Treg function difficult. The Treg field needs a standardized suppression assay that will work well with both healthy subjects and those with autoimmune diseases. We have developed an in vitro suppression assay that shows very little intra-assay variability in the stimulation of T cells isolated from healthy volunteers compared to subjects with underlying autoimmune destruction of pancreatic β-cells. The main goal of this piece is to describe an in vitro human suppression assay that allows comparison between different subject groups. Additionally, this assay has the potential to delineate a small loss in nTreg function and anticipate further loss in the future, thus identifying subjects who could benefit from preventive immunomodulatory therapy1. Below, we provide thorough description of the steps involved in this procedure. We hope to contribute to the standardization of the in vitro suppression assay used to measure Treg function. In addition, we offer this assay as a tool to recognize an early state of immune imbalance and a potential functional biomarker for T1D. Take 1ml of M-450 tosylactivated beads from original vial, place in magnetic stand and hold until all the beads have adhered to the side of the tube. Remove the buffer while tube is still in the magnetic stand. Take tube out of magnetic stand and add 1ml of buffer1, place the tube in magnetic stand again and remove the buffer1 while tube is in the magnetic stand; resuspend beads in 1ml of buffer1 and add 40μl of anti-human CD3, agitate at 37°C for 15 minutes, add 0.1%w/v BSA and continue agitating for next 16 hours. Wash the beads in buffer2 twice for 5 minutes at 2-8°C and once in buffer3 for 5 minutes at 2-8°C using magnetic stand as explained above; remove the buffer and resuspend the beads in 1ml of buffer2; the beads are 4x108/ml final concentration and ready for use. Aliquot 50,000 and 25,000 PBMC/well in triplicates in a 96-well plate and add variable number of CD3-coated beads (4x108beads/ml, CD3 1μg/ml, for example 1, 2, 3, 4, 5 beads/cell) in order to determine the optimal number of beads per cell. After 72 hours in culture, add 1μCi [3H] thymidine and continue incubating at 37°C for the next 16 hours. Harvest cells in Multiscreen harvest plate (Millipore), add scintillation liquid and read counts per minutes (cpm)/well using Top Count NXT (Packard, CT). Use the beads/cell ratio when cpms are above 5000 but less than 15000 to avoid overstimulation of Tregs, which might lose suppressive function. Usually, ratio of 3 beads/cell stimulates both responder and Treg cells in all subject groups tested so far1-4. Dilute the BC (˜50ml) 1:6 with PBS (add 250ml). Now there is 300ml total volume. Slowly layer 25ml of diluted BC on top of 15ml Ficoll-Paque PLUS added to 50ml Falcon tubes, without disturbing the layers. Centrifuge at 800xg (1400rpm in a Sorvall centrifuge with swinging bucket rotor SH-3000) for 30 minutes at 4°C, with brakes turned off. Carefully collect the PBMC layer (intermediate phase) and transfer it to a fresh 50ml Falcon tubes. Wash PBMC by filling the tubes up to 50ml with DPBS. Collect 2 cell pellets into one tube. Centrifuge at 400xg for 10 min at 4°C. Repeat washing step twice, each time combining 2 cell pellets into a single tube. Combine all cell pellets into a single 50ml tube. Count PBMC using Trypan Blue exclusion test. Make a 1:10 dilution in Trypan Blue by adding 20μl of PBMC to 180μl of Trypan Blue stain. Mix well and take 20μl to count in hemacytometer immediately. Count numbers of all unstained and only blue stained cells located in two square blocks each containing 16 smaller squares. Take the average of both numbers and multiply by 10. Divide this number by 100 to get the number of PBMC/ml. Percentage of viable cells calculate as [1-(number of blue cells/number of total cells)x100]. Proceed if viability is ≥95%. Before proceeding, transfer 1ml of PBMC into a new tube, add 4ml of media to prepare cells for irradiation with 5000rad- these will be antigen-presenting cells (APC). Centrifuge the rest of the cells at 250xg in PBS/2mM EDTA/0.5%BSA buffer for 10min at 4°C. Pour off supernatant, and resuspend cells in 4ml of PBS/2mM EDTA/0.5%BSA buffer. Add 200μl of MACS anti-CD4 microbeads and incubate at 4°C for 20 minutes. Wash by adding 40ml of PBS/2mM EDTA/0.5%BSA buffer and centrifuge at 250xg for 10min at 4°C. Pour off supernatant and resuspend in 8ml of degassed, room temperature PBS/2mM EDTA/0.5%BSA buffer. Filter-separate the cell suspension using Pre-separation filters before loading them on an LS column. Split the cell suspension and layer 4ml each over calibrated LS column (with 3ml of deggassed PBS/2mM EDTA/0.5%BSA buffer). LS column is fixed in the MidiMACS separator. Before cell suspension runs out, either re-run flowthrough or add 3ml of deggassed room temperature PBS/2mM EDTA/0.5%BSA buffer and let the buffer run through. Add more buffer until it comes out clear. Pipette 5ml deggassed buffer onto the LS column, remove LS Column from the MidiMACS separator and place into a new sterile 15ml collection tube letting ˜1.0ml run through. Put the plunger into the column and slowly push the rest of the volume out. Do the same with both LS columns and combine the two CD4+ fractions. Add up to 50ml PBS and count cells. Expected yield is up to 5x108 cells. Centrifuge at 400xg for 10 minutes and resuspend cells well in 2ml PBS/2mM EDTA/0.5%BSA buffer. Make a cocktail of antibodies to CD markers to the following cell surface markers (keep protected from light): 20 μl of anti-human CD8-FITC (clone RPA-T8), 20 μl of anti-human CD14-FITC (clone M5E2; LPS receptor), 20 μl of anti-human CD32-FITC (clone FLI8.26; FcγR-type II) and 6 μl of anti-human CD116-FITC (clone M5D12; GM-CSFRα chain) and, alternatively, add 40μl anti-human CD4-APCCy7 (clone RPA-T4). Take 5μl out of the 2ml cell suspension and stain with 2μl of stain cocktail; this is a tube for determining the threshold (Fluorochrome Minus One-FMO)5. Add 50 μl of anti-human CD25-PE (clone M-A251; IL-2Rα) to the stain cocktail, and add the cocktail to cell suspension and incubate at 4°C 30 minutes. Wash cells in PBS buffer, centrifuge at 400xg for 10 minutes and resuspend cells to a cell concentration of 107/ml. Prepare unstained cells and cells or beads stained with single fluorochrome to use as compensation control for cell sorting on FACS Aria (BD Biosciences, San Jose, NJ). Acquire cells in the FMO tube which will allow the user to set the threshold for sorting of CD25+ T cells (Figure 2a). Set a gate around FITC-negative cells to exclude FITC-positive cells comprising monocytes, macrophages and all other CD4+-non-T cells (Figure 2b). In a separate plot, draw gates for CD25-, CD25low and CD25high T cells-Tregs (top 1% of cells expressing the highest number of CD25) (Figure 2c). Cell subsets typically show high purity (Figure 2d, 2e and 2f). Centrifuge collection tubes with cells at 400xg for 10 minutes and keep them on ice until plating. Aliquot 50μl of CD3-coated beads (1 μg/ml) calculated to be 3 beads/responder cell in a well, resuspended in complete media with 10% pooled human AB serum in U-bottom 96-well plates. (For example, to make 2ml media with CD3-coated, take 7.5μl from stock of CD3-coated beads -final concentration 4x108/ml and dilute in 2ml of media; every 50μl will contain 75,000 beads-3beads/cell). Dilute irradiated APC to 5x105/ml cell concentration and add 50μl (will contain 2.5 x 104 cells) into each well with previously added stimulation, including wells labeled as "Tregs only", "APC only" and "media only" in Table 1. Add 2.5 x 104/well CD4CD25- or CD4CD25low T cells in triplicates following design in Table 1. Add Tregs to co-cultures (row B, Table 1) in the ratio 1:10 (2,500 Treg cells) and to wells labeled as "Tregs only" and incubate the plate at 37°C in CO2 incubator with 5% CO2, in saturated humidity for 72 hours. Pulse wells with 1μCi [3H] thymidine and continue incubation at 37°C for next 16 hours. Harvest cells on multiscreen harvest plate using Packard filtermate harvester or alternative system. Add scintillation liquid (Microscint 20), cover harvesting plate with transparent plastic cover in preparation for the final step. Read counts per minutes (cpm)/well using Top Count NXT (Packard, CT) or alternative system. As cells were cultured in triplicates, average is calculated for each condition. If the coefficient of variation is >30%, the outlier is eliminated and only cpm from two wells are averaged. Percentage of suppression is obtained by computing [(s-c)/s] x 100%, where s=cpm in single culture and c=cpm in co-culture. As naïve (CD25-) and in vivo activated (CD25low) effector T cells are plated as responder T cells, the difference in the ability of Tregs to suppress each of these subsets is captured and used as a potential functional prognostic indicator based on the premise that activated cells are harder to suppress. Great variability in the methods used and results derived from in vitro human suppression assay prompted us to perform a comprehensive study of conditions influencing the assay1. We have developed an assay that tests not only Treg function, but also their purity, considering the low ratio between Tregs:Teffs (1:10), which we determined earlier6. In addition, Tregs differ in their ability to successfully suppress naïve and in vivo-activated T cells even in healthy subjects, as shown in Figure 3 and in our previous studies2,4, which becomes more prominent if immune balance is compromised, as in subjects at risk to develop T1D. The assay worked very well in the study where we compared suppressive function of natural (nTregs), inducible (iTregs) and in vitro expanded nTregs, allowing us to compare their function between healthy control, recent-onset (RO) T1D and longstanding (LS) T1D subjects. We concluded that RO T1D subjects had better capacity of generating functional both iTregs and expanded nTregs compared to LS T1D and healthy control subjects7. Thus, this assay can be used as an excellent tool in the recognition of both an early and late state of immune imbalance. Figure 3. Representative results of healthy subjects a) Representative results of counts per minute (cpm) of healthy subjects presented as single cultures for all cell subsets involved (naïve-CD25-, in vivo activated-CD25low, antigen-presenting cells-APC and regulatory T cells-Treg) as well as co-cultures of responder T cells (CD25- or CD25low) and Tregs. b) Percentage of suppression of each CD25- and CD25low responder T cells by autologous Tregs is presented for healthy control subjects (n=4). Suppression was computed as [(s-c)/s] x 100%, where s=cpm in single culture and c=cpm in co-culture. Although slight difference in capacity of Tregs to suppress responder T cells was noticed, it was not significant (paired t-test p=0.08). c) Presented are cpm of at risk subjects for each single culture, including CD25- and CD25low as responder T cells as well as APC and Tregs, and co-cultures where each responder T cell subset is seeded with Tregs (CD25-/Tregs and CD25low/Tregs). d) Percentage of suppression of each CD25- and CD25low responder T cells by autologous Tregs is presented for at risk subjects (n=4). The difference in capacity of Tregs to suppress CD25- versus CD25low responder T cells was significant (paired t-test p=0.04). As the only unique feature to Tregs, suppressive function should be tested reliably and uniformly between subjects at different phases of disease development within the same and between different studies. We offer details of the suppression assay developed in our laboratory as our contribution to the standardization of this assay. 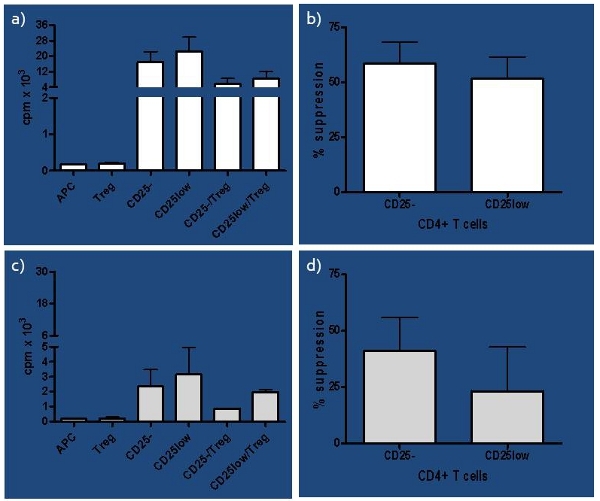 In our extensive optimization study, we have determined that T cell stimulation with anti-human CD3-coated beads (UCHT1 clone, in concentration of 1μg/ml (as opposed to commercially available 5μg/ml) in combination with PBMC as APC provide natural stimulation capable of activating well both responder T cells and Tregs in tested subjects1. The choice of anti-human CD3 antibody is of great importance, as in our hands only Ancell antibody gave the expected results. Simultaneous stimulation with anti-human CD3 and anti-human CD28 was not sufficient to detect differences between subject groups (results not shown), while PBMC offered a complete palette of co-stimulatory signals, increasing the chance of signal transduction and efficient stimulation. This protocol can be used with both leukopacks and patient blood. The only difference is the amount of blood that needs to be loaded on top of the Ficoll-Paque PLUS in PBMC isolation procedure. Media used in this assay contains 10% pooled human AB serum, which we determined to be a great addition to the assay. However, before being used, the serum has to be tested for the ability to activate PBMC on its own (seed PBMC in sixplicate and add complete RPMI media with the old serum, with no serum and with a new serum. After 72 hours pulse the plate, incubate 16 additional hours at 37°C, harvest cells and obtain cpm readings). Increased cpm of PBMC cultured with new serum is not good result and suggests a need for a serum with new lot number. We have determined that MACS sorting done manually with a new LS column for each sample gives considerable better yield of CD4+ T cells compared to Automax. In addition, Treg purity was determined to be >95%, as judged by CD25 expression (Figure 2d), lack of in vitro proliferation (Figure 3a), high suppressive potential in healthy subjects in a ratio 1:10 between Treg:responders (Figure 3ab) and highest Foxp3 expression among isolated T cell subsets (data not shown). The contaminating cells are eliminated as FITC dump during FACS sorting procedure in the next step (Figure 2b). 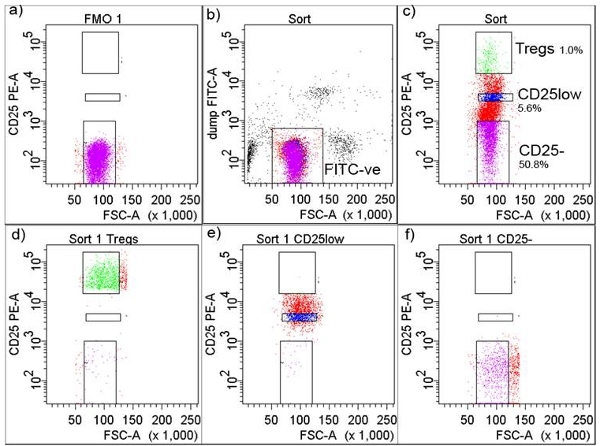 FACS staining of CD4 marker is not necessary and this cell population can be seen through FSC in a plot when combined with anti-human CD25, however it could be done. Tregs are sorted as top 1% of cells expressing the highest number of CD25 in all subject groups. Applying this rigorous procedure to all subjects independently of disease status enabled us to use only one ratio between Tregs and responder T cells (1:10) in all subject groups tested. Additionally, the same conditions work so well that a difference in Treg suppressive potential was seen between naïve and in vivo activated T cells used as responders, which, based on the differences between them, could be expected1. We have also determined that after FACS sorting cells have to be spun down before being set up in suppression assay. Proliferation was measured using tritiated thymidine. Alternatively, cell proliferation can be measured using 5-bromo-2'-deoxyuridine, a pyrimidine analog, which is incorporated into newly synthesized DNA instead of thymidine. Detection of BrdU is based on dissociation of europium, an ion bound to antibodies recognizing BrdU (anti-BrdU-Eu) that in the procedure of signal detection gets dissociated releasing fluorescence that can be measured in a fluorometer8. According to manufacturer (DELFIA) this assay is comparable sensitivity to [3H] thymidine. Tracking cell proliferation could also be done using, for example, derivatives of tetrazolium salt in MTT or XTT assays available from ATCC, where the relationship between cell number and signal produced has to be established first, allowing spectrophotometric quantification of changes in the rate of cell proliferation and viability. 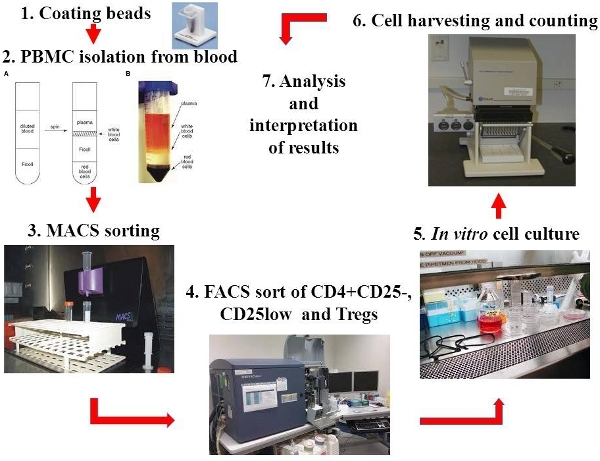 Yet another alternative is use of DHL cell viability and proliferation assay, based on fluorimetric quantification of living cell numbers and viability. Other potential choice is to stain responder T cells only with CFSE (carboxyfluorescein succinimidyl ester) and monitor reducing of the stain with every next division during culturing time. However, depending on stimulation used in the assay, longer incubation of more than 48 hours can cause indistinguishable peaks of CFSE-positive cells. Thus, each of the assays has some advantages and disadvantages and has to be optimized to achieve desired results. Cpms for testing anti-human CD3-coated are always performed on healthy PBMC and they should be above 5,000 but not above 15,000 in order for beads to be used in this type of an assay. We usually set up different beads/cell ratio when testing each batch of beads we make, and in most cases we have the most consistent cpm with 3 beads/cell with 25,000 cells/well. We usually repeat coating if cpms during batch testing are below 3,000, until we reach 5,000-15,000 cpm/well. Thus, the coating process has been checked at several levels and we consider it reliable. Therefore, when cpms of certain group of subjects (like auto-antibody-positive subjects at risk to develop T1D) are consistently lower compared to healthy subjects, we have a reason to conclude that signal transduction process might be compromised. , Although many studies have used naïve cells as responders in suppression assays published so far9-12, some, for example, have used either CD4 as responders in very different assay conditions13 or PBMC as responders, in the presence of PBMC as APC and set them up in single and co-culture with added Tregs14 or monocytes15 as suppressors. Even though cpms will be generated in all assay variations and conclusions about the proliferation will be made, we think that having purer uniform cell subset as responders gives more specific results and holds potential to draw additional conclusions about both Tregs and responders. As our suppression assay presented here includes two separate pure cell subsets as responders (CD4+CD25- and CD4+CD25low), it is possible to get valuable information about the immune homeostasis when results from healthy subjects are compared to affected or subjects at risk to develop a disease resulting from perturbation of the immune homeostasis (like T1D). As shown by growing number of studies, in vivo activated T cells (CD4+CD25low) show impaired sensitivity to the suppressive effect of Tregs16-19 . The exact explanation for that behavior requires more investigation. In addition to this, we and others have shown that Tregs in subjects with T1D do have a functional defect2,9,10, which is also true for auto-antibody-positive subjects, at risk to develop T1D, as we have shown in Figure 6 in our recent report1. One of the possibilities is that all CD4 T cells in subjects affected and at risk to develop T1D have a common defect in signal transduction preventing them to respond on stimulation adequately and affecting their effector function. As result of compromised signal transduction, responder T cells would generate lower cpm (shown in Figure 3c) and Tregs would not suppress efficiently. This or other possibilities remain to be further explored. Owing to the great role Tregs play in the health and disease, many laboratories have measured Treg function adjusting the assay to their needs and abilities. Thus, many factors in the assay could vary (responder/Treg isolation, type and number of responders, nature and strength of stimulation, type and number of APC, ratio between responder/Tregs, time in culture, as well as method of monitoring proliferation), affecting the Treg function. This work, therefore, has a goal to start the process of standardization of the assay allowing easier and direct comparison of different studies assessing the Treg function. If adopted, this protocol will allow for the comparison of Treg function between different laboratories for subjects affected with T1D and other autoimmune diseases. This protocol has broad application and can be used for an evaluation of Treg function of any subject, no matter of disease, although its prognostic value pertains only diseases that are result of perturbation of the immune homeostasis. This study was supported by Max McGee National Research Center for Juvenile Diabetesat Medical College of Wisconsin and Children's Research Institute of Wisconsin. The funders had no role in study design, data collection and analysis, or preparation of the manuscript. Barge, A., Cravotto, G., Gianolio, E., Fedeli, F. How to determine free Gd and free ligand in solution of Gd chelates. A technical note. Contrast Med. Mol. Imaging. 1, 184-188 (2006). Nagaraja, T. N., Croxen, R. L., Panda, S., Knight, R. A., Keenan, K. A., Brown, S. L., Fenstermacher, J. D., Ewing, J. R. Application of arsenazo III in the preparation and characterization of an albumin-linked, gadolinium-based macromolecular magnetic resonance contrast agent. J. Neurosci. Methods. 157, 238-245 (2006). Supkowski, R. M., Horrocks, W. D. On the determination of the number of water molecules, q, coordinated to europium(III) ions in solution from luminescence decay lifetimes. Inorg. Chim. Acta. 340, 44-48 (2002). Menjoge, A. R., Kannan, R. M., Tomalia, D. A. Dendrimer-based drug and imaging conjugates: design considerations for nanomedical applications. Drug Discovery Today. 15, 171-185 (2010). Que, E. L., Chang, C. J. Responsive magnetic resonance imaging contrast agents as chemical sensors for metals in biology and medicine. Chem. Soc. Rev. 39, 51-60 (2010). Uppal, R., Caravan, P. Targeted probes for cardiovascular MR imaging. Future Med. Chem. 2, 451-470 (2010). Major, J. L., Meade, T. J. B. ioresponsive Bioresponsive, cell-penetrating, and multimeric MR contrast agents. Acc. Chem. Res. 42, 893-903 (2009). Datta, A., Raymond, K. N. Gd-hydroxypyridinone (HOPO)-based high-relaxivity magnetic resonance imaging (MRI) contrast agents. Acc. Chem. Res. 42, 938-947 (2009). Leôn-Rodríguez, L. M. D., Lubag, A. J. M., Malloy, C. R., Martinez, G. V., Gillies, R. J., Sherry, A. D. Responsive MRI agents for sensing metabolism in vivo. Acc. Chem. Res. 42, 948-957 (2009). Castelli, D. D., Gianolio, E., Crich, S. G., Terreno, E., Aime, S. Metal containing nanosized systems for MR-molecular imaging applications. Coord. Chem. Rev. 252, 2424-2443 (2008). Caravan, P., Ellison, J. J., McMurry, T. J., Lauffer, R. B. Gadolinium(III) chelates as MRI contrast agents: structure, dynamics, and applications. Chem. Rev. 99, 2293-2352 (1999). Lauffer, R. B. Paramagnetic metal complexes as water proton relaxation agents for NMR imaging: theory and design. Chem. Rev. 87, 901-927 (1987). Yoo, B., Pagel, An overview of responsive MRI contrast agents for molecular imaging. Front. Biosci. 13, 1733-1752 (2008). Pandya, S., Yu, J., Parker, D. Engineering emissive europium and terbium complexes for molecular imaging and sensing. Dalton Trans. 23, 2757-2766 (2006). Nwe, K., Xu, H., Regino, C. A. S., Bernardo, M., Ileva, L., Riffle, L., Wong, K. J., Brechbiel, M. W. A new approach in the preparation of dendrimer-based bifunctional diethylenetriaminepentaacetic acid MR contrast agent derivatives. Bioconjugate Chem. 20, 1412-1418 (2009). Nwe, K., Bernardo, M., Regino, C. A. S., Williams, M., Brechbiel, M. W. Comparison of MRI properties between derivatized DTPA and DOTA gadolinium-dendrimer conjugates. Bioorg. Med. Chem. 18, 5925-5931 (2010). Caravan, P., Das, B., Deng, Q., Dumas, S., Jacques, V., Koerner, S. K., Kolodziej, A., Looby, R. J., Sun, W. -C., Zhang, Z. A lysine walk to high relaxivity collagen-targeted MRI contrast agents. Chem. Commun. 430-432 (2009). Leôn-Rodríguez, L. M. D., Kovacs, Z. The synthesis and chelation chemistry of DOTA-peptide conjugates. Bioconjugate Chem. 19, 391-402 (2008). Boswell, C. A., Eck, P. K., Regino, C. A. S., Bernardo, M., Wong, K. J., Milenic, D. E., Choyke, P. L., Brechbiel, M. W. Synthesis, characterization, and biological evaluation of integrin αVβ3-targeted PAMAM dendrimers. Mol. Pharm. 5, 527-539 (2008).